Hello and welcome to week #2 of Christmas Tidings! 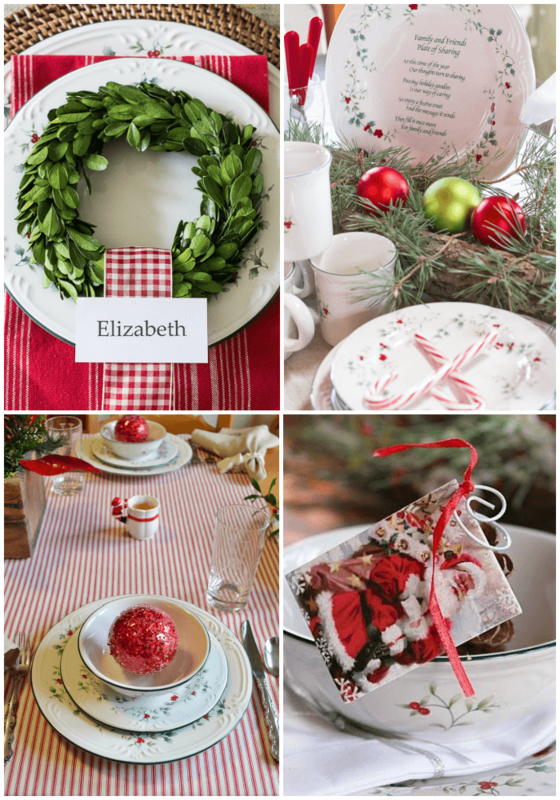 We’re each featuring a Winterberry Christmas Tablescape and to top things off we also have a giveaway. Winterberry by Pfaltzgraff is a timeless collection of Christmas china that fits into any decor and any budget. Available at Macy’s, it’s easy to start with just a few pieces and add to it every year. For my tablescape I kept things simple and tried to work in some natural elements. I used wicker chargers, burlap runners and preserved boxwood. For the place cards I used my good old inkjet printer and printed our names on card stock. I used double sided tape to attach the ribbon together after looping it through the wreath and a bit more tape to attach the card to the ribbon. I got the little wreaths from Antique Farmhouse. As a substitute for the boxwood you could also use little grapevine wreaths and perhaps add a little greenery. I know Hobby Lobby has tiny wreaths for just a few dollars because I used them in this Acorn Wreath project. To go along with my table settings, the nice people at Pfaltzgraff sent me this Snowflake Egg Plate. I know it should have delicious deviled eggs in it…so please forgive me for substituting these little ornaments. Making deviled eggs just wasn’t in the cards! I wanted to show you what I did with my giant pine cones this year. I wasn’t sure I would be able to top last year’s idea but I think I may have done just that. I love them in the silver urns. Sort of a mix of shiny and rustic. It literally took five minutes to plop the pine cones in the urns and add the greenery. Can’t beat that for easy and quick! 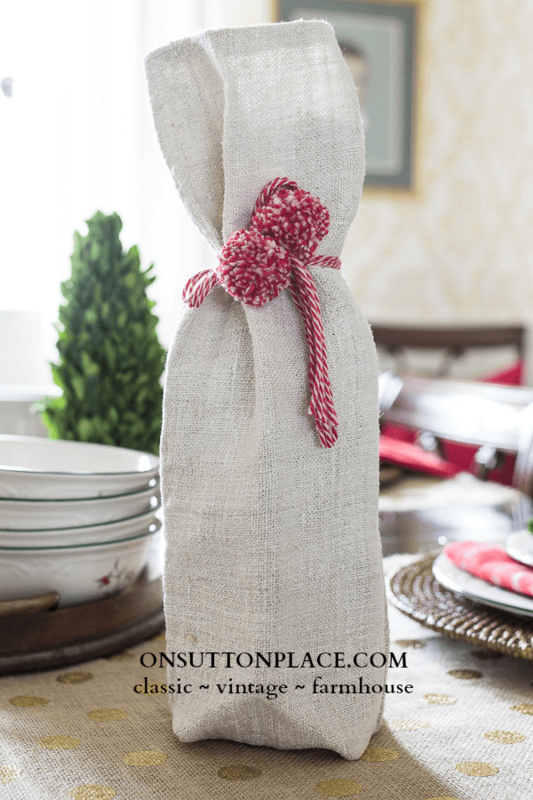 I just listed a few of these grain sack wine sleeves in my Etsy shop. I hate to waste any part of a grain sack so I thought these would make a lovely gift for a special friend or hostess. I had a blast making the little pom poms too…in fact I have a project coming up where I use them and it actually turned out pretty good. Wonders never cease. Don’t forget to visit my friends to see how they used their Winterberry! I received a set of Winterberry dishes and the Snowflake Egg Plate in return for this sponsored post. I love them and as always, all opinions are my own and truthful. 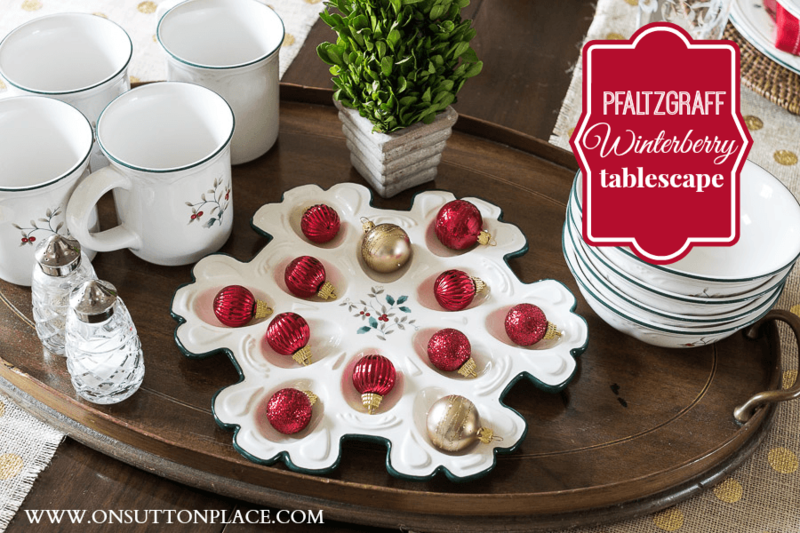 We are giving away TWO sets (4 place setting each) of Pfaltzgraff Winterberry. Just enter via the Rafflecopter below. Two random winners will be selected and notified next week. The table looks so inviting. The natural elements are my favorite, and I like how you paired it with the red napkins and wicker chargers. Very inspiring! What a gorgeous table setting! I think it’s my favorite that I’ve seen thus far! I have this pattern, a Christmas gift several years ago, but one place setting was damaged in a recent move. I have never seen this egg plate before…LOVE it! Ann, I love how you’ve used so many different textures with the Winterberry. I love the pretty pattern! I hope I win!!! Thank you for your inspiration Ann. As always you have such wonderful ideas!! Hi Ann, Oh your table is soooo beautiful. It sure looks like you are having fun!! Happy Holidays! Love your tablescape and would be delighted to have a chance to win the dishes, but I am not a Facebook person. Could you add a way that we could enter? 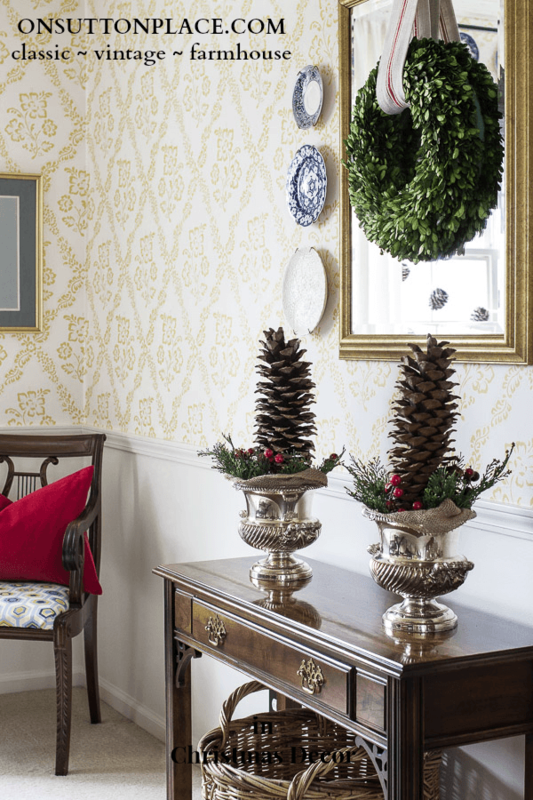 Ann ~ I have always loved Pfaltzgraff’s Winterberry pattern and adorning it with boxwood and wicker looks even better! You always know just what it takes to create a cozy classic country feeling. Thanks once again Ann for sharing your inspiration. I love your table setting! 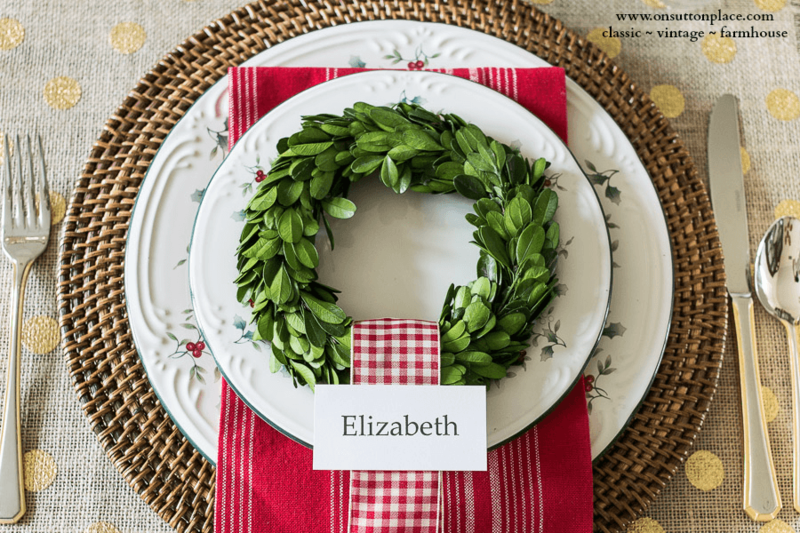 The little boxwood wreaths make a great plate topper with the name card attached. I don’t think I would’ve ever thought of that! I also like how you used your giant sugar cones. I have 2 myself but never thought to stand them on their ends like that. Very cute! Enjoy your site and posts. Your breads are delicious and so simple to make. Thanks for a chance to win! I love your huge pine cone decorations. The dishes are lovely…so classic. Loved everything! Did you make the burlap table runner. Love to try to make one, but I’m not much of a seamstress. Love to join your contest, bit I don’t do facebook. What a wonderful give away! I’m keeping my fingers crossed. :-). Your tablesetting is so lovely! What a lovely table! I love seeing the pattern used 4 different ways. I think the ornaments in the egg plate is genius! Great giveaway! Ann, everything you do is beautiful. Oh, Ann, your home is so lovely. When i was seventeen i was invited to my first Bible Study and walked into a home very much like yours and i knew that i knew that i wanted what these ladies had that caused them to make an environment of grace like that…and after they introduced me to Jesus then I knew that I knew I wanted a home like this lady had so I could invite lost little girls in and they could be found. Whenever I visit Your home it brings those long ago sweet memories to mind. What a beautiful table! Wish I could enter to win the lovely dishes, but I’m not on Facebook. I love the Winterberry pattern. 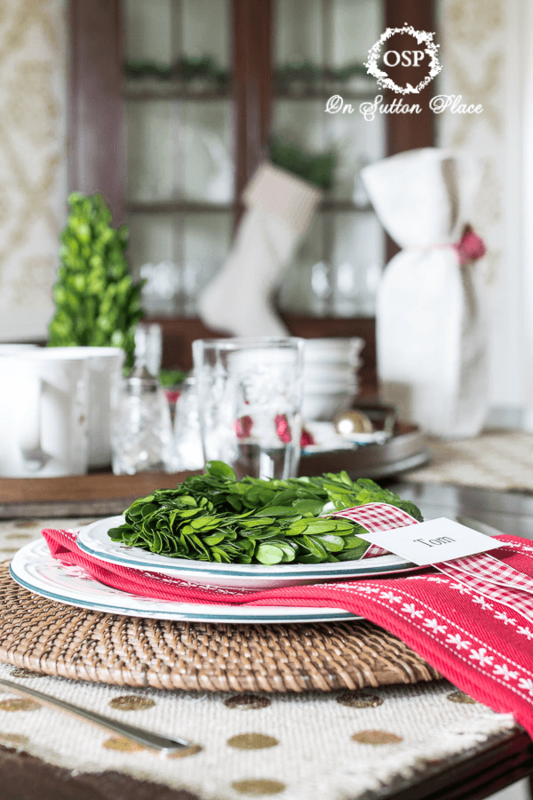 They’re beautifully displayed in your tablescape. Wonderful giveaway. Wish I could enter, but I don’t have a facebook page. A beautiful giveaway. Wish I could enter, but I don’t have a facebook page. I love the deviled egg dish Ann! And those preserved boxwood wreaths are gorgeous! I hope you are sharing how to make those little pom-poms because I don’t know how! They are the perfect touch for the wine bag! I LOVE your table setting! It’s so pretty how you used the wreaths. Oh how clever you were on that deviled egg dish. So cute Ann. 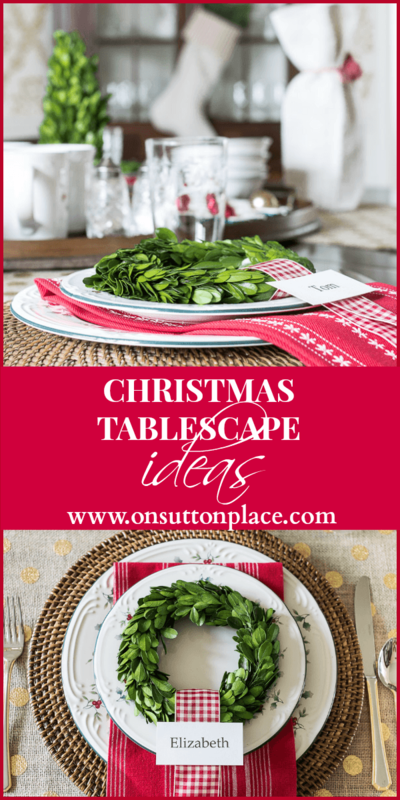 I love the placemats and the greenery too. Just gorgeous with this set. OK…I just laughed out loud. Clever indeed! Your place settings are alway so elegant and this one is just perfect!